In coming years we may expect our online individual and organizational leader lists, maps, and dashboards to be community rated, to update in real-time, and to be stratifiable by country, industry, method, skill set, and many other variables. Given current IT and big data trends, we might see good reputation-based Foresight Leader Lists emerge on business social networking and rating sites later this decade. LinkedIn’s recent addition of crowd-rated skills (here are the 25 most-hired LinkedIn skills of 2013) is a small but important step in this direction. As our public lists get better, and both their job-finding benefit and their validation criteria get more rigorous, we can expect coaching services that will help each of us get better at getting onto and growing our ratings on the particular lists we care about. Web leader lists increasingly use network analysis and semantic analysis, and the better ones make their results and methodologies accessible to public inspection and critique. Google’s Knowledge Graph is a leading initiative in this space. Web intelligence platforms like Recorded Future are also among the current state of the art, but they are private, not public, and they cover only certain large industries at present. Fortunately software for scraping web databases and doing simple network and semantic analysis and visualization is now available for those who want to do it themselves. For a great intro to those techniques, see futurist Ross Dawson’s book, Living Networks (2008). 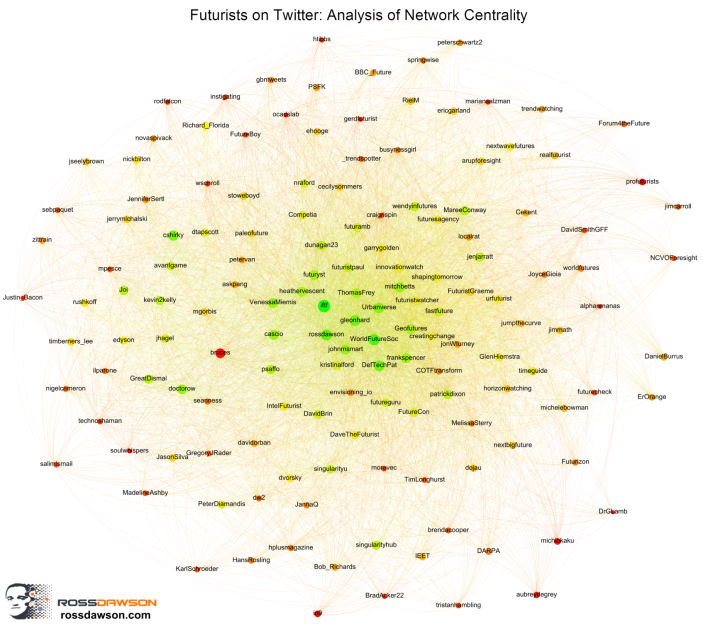 As an example of this work, Ross recently did a network analysis of relationships between 202 futurists he follows on Twitter. Using two software tools called NodeXL (for network analysis) and Gephi (for visualization), he mapped authority (e.g., how often someone’s tweet is favorited or retweeted by others in the network), visually represented below by the size of each node, and centrality (who is connected to who else in the network, represented by the color of each node). Both variables give rough indications of how each person relates to others in the network, either in the small network or the network of all Twitter users, depending on the analysis. This analysis (see picture below) gives Ross social information on a community that he cares about, and when he shares it publicly, we all benefit. Perhaps these tools could be useful to you as well.